The Moon is the nearest planet to Earth and the Sun is the most potent body according to Jyotish. Both of these planets help in guiding a person's destiny. By considering their relative effect to each other we can find out how each modifies the other's influence and generates different results. 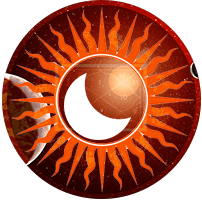 The combined influence of Sunsign and Moonsign has unique insights into your horoscope that the separate analysis does not posess.